If you're looking for a delicious, easy, and healthful idea for preparing shrimp, grilling may be the answer you seek! There are plenty of tasty ways to prepare shrimp, with options for every taste preference. Whether you like super-spicy shrimp or prefer a tart, citrusy flavor, you're sure to find one (or more) recipes you love in this collection. If you're looking to master the art of cooking grilled shrimp, check out this wonderful recipe for grilled shrimp with garlic and lemon. Created by James Beard award-winner J. Kenji López-Alt, who serves as Chief Culinary Advisor for Serious Eats, this recipe reveals the secret of prepping shrimp using baking soda, something you can apply to other recipes as well. This dish is flavored with garlic and lemon (of course! ), as well as salt, sugar, garlic, olive oil, and parsley. Tomato sauce isn't the first thing that comes to mind when you think about making a marinade for shrimp, but it works in this delicious recipe for marinated grilled shrimp. This recipe has a five-star rating with over 2,300 reviews on AllRecipes, so it definitely passes the 'tried and true' test! In addition to tomato sauce, the marinade also has garlic, cayenne pepper, red wine vinegar, olive oil, basil, and salt. While grilled bacon wrapped shrimp aren't the fastest dish to prepare, they are worth the effort. Celebrity chef Guy Fieri shares his recipe for bacon-wrapped shrimp with Chipotle barbecue sauce on the Food Network's website. You'll need to cook the bacon partially on the stove before individually wrapping the shrimp for grilling. Brush wrapped shrimp with chile garlic oil and thread on skewers for cooking. Serve with your favorite barbecue sauce flavored with chipotle, Dijon mustard, cayenne pepper and red pepper flakes. If you're looking for a flavorful spin on basic shrimp kabobs, try celebrity chef Bobby Flay's grilled shrimp skewers recipe. Seasoned with a combination of garlic, oregano, chili flakes, salt, and pepper, these versatile skewers taste terrific with any side dish. If you're looking for a shrimp dish with a tropical flair, you're sure to love these delicious grilled shrimp with mango salsa from celebrity chef Emeril Lagasse. The seasoning mix is similar to the recipe above, but also includes cilantro, lime, and olive oil. Plus, the salsa features mango, bell pepper, lime, honey, and more. If you love the flavors of Southeast Asia, check out this recipe from chef Chris Schlesinger. You'll find instructions for making his Southeast Asian-style grilled shrimp with aromatic herbs on Martha Stewart's website. Keep in mind this recipe is intended to be used with jumbo-sized shrimp that have the heads on. This dish gets its unique flavor from lemongrass, mint, fish sauce, Thai basil, and other flavorful ingredients. This Taste of Home test kitchen approved recipe for Cajun shrimp skewers provides a simple way to bring the flavors of New Orleans to your dining room table no matter where you live. 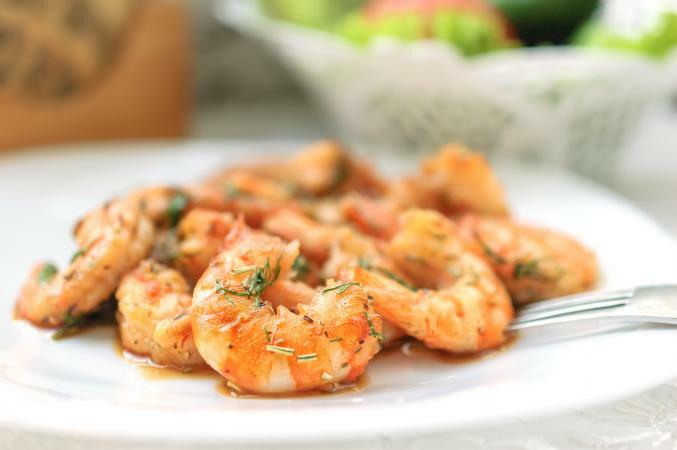 Flavored with Creole seasoning, oil, rosemary, thyme, and garlic, these shrimp have quite a kick. For even more flavor, whip up a batch of Cajun butter (instructions included) to serve with them.